At Gateway CrossFit Personal Training in Clayton, we love our clients and strive to be there for you throughout your fitness journey. If you’re new to CrossFit, we’d like to point out that our CrossFit personal training sessions are not “classes;” they are private workouts utilizing the best aspects of exercise and resistance in a fast-paced, intense, yet friendly environment. Our goal is to see you get in the best shape of your life! If you’d like to find out what others have experienced, please read our testimonials and other pages about Gateway, as well as the answers here to a few of the most frequently asked questions. CrossFit is a fitness program built on constantly varied, functional movements executed at high intensity. It utilizes weightlifting, body weight movements, and cardio elements (running, rowing, etc.) in constantly varied combinations. By performing full-range, functional movements across a wide variety of times, loads, and distances, CrossFit workouts train the body across all energy pathways, develop dramatic increases in strength and power, and elicit a profound neuroendocrine response. Consequently, participants enjoy unparalleled improvements in fitness and body composition. Not only does CrossFit provide dramatically superior fitness and weight loss results, it is more enjoyable than conventional workout programs due to its constantly changing nature and use of natural movement patterns. CrossFit also provides an extremely high level of carry-over to life outside the gym as it uses universal movement patterns found in everyday life. Functional movements are safe, they develop useful core strength, and they are the best rehab movements you can do. With conventional gym routines, the use of weight machines and isolation of body parts does not develop the profound increase in physical capacity produced by CrossFit. If the only place you ever do a particular movement is in the gym, it probably doesn’t have value to sports or life outside the gym. Finally, CrossFit programming is designed for universal scalability or customization. “It has long been our contention, our observation, that people’s needs differ by degree, not kind. Olympic athletes and our grandparents both need to fulfill their potential for cardio-respiratory endurance, stamina, strength, flexibility, speed, power, coordination, accuracy, balance, and agility. One is looking for functional dominance; the other is looking for functional competence. Competence and dominance manifest and optimize through identical physiological mechanisms. We scale our program by altering rest, load, intensity, etc. while utilizing the same exercises for everyone whenever possible.” – Greg Glassman, CrossFit founder. For whom is CrossFit appropriate? One of the beautiful aspects of CrossFit is that our programming is scalable. This means it’s appropriate for nearly everyone. We scale our program by altering rest, load, intensity, range of motion, etc. To date, our clients have ranged in ages from 14 to 80 years old. Grandparents and the unconditioned can train alongside top-tier athletes using the same programming. For whom does CrossFit work best? The Unconditioned. 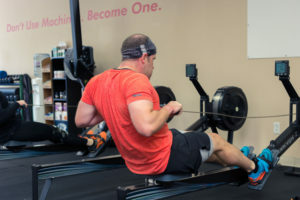 As a personal-training-only facility, Gateway CrossFit Personal Training is particularly well-suited for new trainees. Our programming model and our expertise give us the time and ability to review and develop skill sets and physical capacity in the unconditioned. Since CrossFit is completely customizable, it is ideally suited for developing trainees. And because CrossFit falls in the category of general physical preparedness it develops all aspects of our trainees’ fitness. Weight Loss/Improved Body Composition. These goals can most effectively and quickly be achieved using a program that addresses appropriate levels of calorie consumption, promotes the addition of lean muscle to burn fat at rest, stimulates large-scale production of lean tissue developing hormones, and includes sound dietary advice. No other fitness program does a better job of meeting these criteria than CrossFit. Fitness Enthusiasts. For those already involved in the fitness lifestyle, CrossFit represents the pinnacle of the fitness experience. Serious fitness devotees will find in CrossFit a program that takes their fitness to new levels, provides superior motivation and mindset, and allows them to compare their efforts and abilities against other fitness enthusiasts across the globe through the CrossFit benchmark workouts. CrossFit develops and challenges the elite armed forces units of the United States and Canada; operators whose lives depend on well-rounded and completely developed fitness. If it can provide those levels of development for them, imagine what it can do for you. Endurance Athletes. The popularity of endurance athletics is exploding. It seems everyone these days is running a race or entering a triathlon. Unfortunately, except for those at elite levels, endurance training makes for weak and slow athletes. To improve performance, beginning and intermediate endurance athletes need to increase their strength and power while not decreasing their aerobic fitness. CrossFit is ideal for this. Endurance sports often lead to strength imbalances, overuse injuries, and flexibility issues. A well-designed conditioning program like CrossFit will help address and correct these problems. Students and Young Athletes. Young people today face a dizzying onslaught of influences; few of them healthy. Gateway CrossFit Personal Training provides a safe, motivating environment in which they can develop their fitness and confidence while learning fitness and lifestyle skills that will serve them for a lifetime. Young athletes are in need of a fitness program that develops a well-rounded performer who is strong, flexible, and optimally conditioned. Gateway CrossFit Personal Training provides all of these, while teaching correct form on complex movements. Our student-athletes progress faster than their peers, perform better in their sport, and experience fewer injuries on the field and in the weight room. CrossFit sounds too intense for regular folks. Is that really necessary? We believe that it is. To explain, it’s helpful to look at our history as a species. Our gene sequence evolved during the Paleolithic Era, which ended 10-12,000 years ago with the advent of agriculture, and hasn’t changed appreciably since then. Our Paleolithic ancestors fought and foraged for their survival every day, and their genes reflected that. We are no different. To optimize our genetic expression we need regular hard work or exercise. By providing intense physical stimuli across a wide range of variables, Gateway CrossFit Personal Training workouts not only develop superior fitness, they maximize healthy gene expression. The result is the healthiest, most vibrant you possible. Absolutely! Efficacy and Priorities are the key concepts here. Efficacy. Unfortunately, only a small percentage of people who exercise truly achieve the results they desire. And many barely get results at all. But that’s not surprising. Joining a gym without knowledge of how to achieve results is like going to an auto repair garage to repair your car and being expected to fix the car yourself. What would you do?! Training at Gateway CrossFit Personal Training is like hiring a mechanic, a plumber, or an attorney. For the best results, see a professional. Priorities. If you take a moment to really examine some of the ways you spend your money, you may notice your priorities changing dramatically. Nothing is more important than our bodies and our health. Without our health, all other blessings in our lives are impossible to enjoy fully. How do your financial priorities stack up against this truth? Ask yourself how much of your budget is devoted to your fitness and wellness. How does that compare to your car payment or your house payment? How much do you spend on entertainment and impulse purchases? In that context, it’s easy to see that safe, effective, and motivating training at Gateway CrossFit Personal Training isn’t an extra cost; it’s a vital investment.